Do you need high speed internet service in Johnnie for a convention or other temporary event? LV.Net has the capabilities to serve Johnnie with quality high speed wireless microwave internet. Our wireless network can provide internet speeds of up to 1 Gbps without difficulty. 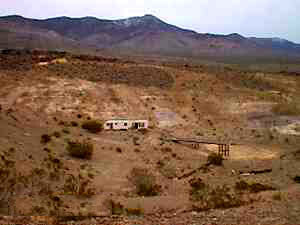 It can reach even very remote areas in the state of Nevada, providing uncompromising high speed internet access. LV.Net’s wireless microwave internet does not require fiber optic cable in order to install a connection. The climate or the environment is also not an issue. LV.Net operates its high speed wireless network through a series of radio relays. Microwave transmissions travel in a line of sight path at close to the speed of light. The line of sight path taken by microwave radio transmission can sometimes be a more efficient route than that taken by signals traveling via fiber optic cable. The network is designed with unmatched flexibility and redundancy to provide the best performance. You are guaranteed quality high speed internet no matter what scale of service is involved or the distance from Las Vegas. LV.Net’s microwave network is designed to achieve a 99.999 uptime. We do this by using licensed carrier-grade radios on major backbone points, as well as multiple transit links on our towers using OSPF protocol and fault tolerance techniques. We also use reporting and alerting of errors on equipment that permits pro-active management. The system also uses a redundant power design, and we keep standardized equipment in a “cold spare” state in the event that any issue merits using a replacement. LV.Net’s wireless network is top tier. We can install a connection on even some otherwise difficult to service areas such as RV parking lots, industrial facilities, campgrounds, gazebos, convention areas, and locations that do not have fiber cable access. We can also install Wifi hotspots in these places. LV.Net is able to service almost any type of structure such as multi-story office buildings, office complexes, and residential homes. LV.Net’s microwave network is an alternative to using fiber optic cable for high speed internet access, and is available for service. Our network has grown over time. And our staff has grown with the increased demand. Our technical support personnel are available 24/7, every day of the year in case you need to contact us. They are trained, experienced, and are ready to provide assistance should a need arise. They are able to help with any issues regardless of where the end user of internet service is located. One feature high speed wireless internet offers compared to fiber cable internet is that the path of wireless transmissions has fewer points that the signal needs to traverse through to reach the final destination point. This can mean going through fewer switches or routers for data. In the event that any such point should fail in a fiber cable system, the network could go down. With microwave internet, there are less potential points of failure and there is no cable to maintain over distances covered by wireless transmission. The cost of using a wireless connection compared to fiber optic cable can often be less as well, depending on the particular situation. LV.Net is now ready and able to accommodate all of your wireless internet needs in Johnnie on any scale. We will be there to provide maximum high speed internet. Our abilities know no limits. Please call us at 702.900.0000 to get a quote, or email us regarding high speed internet service in Johnnie. Thank you. Have a convention or in need of temporary High Speed Internet 1Mbps to 1000Mbps in Johnnie call us now 702.900.0000 for a quote or email us.